As UKIP kicked off its EU referendum campaign yesterday, the campaign faces a difficult choice over how prominently to use Nigel Farage to communicate its key messages, public affairs experts say. 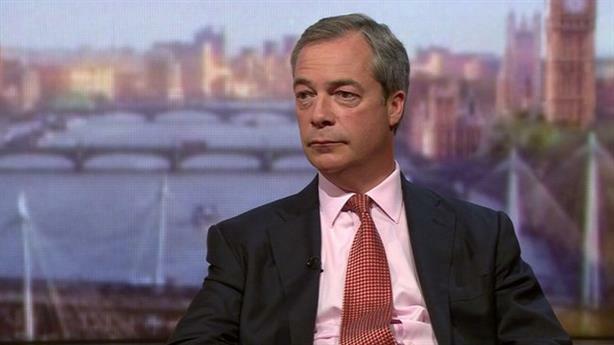 Nigel Farage: "Whatever my shortcomings, I think I'm probably better than nobody." At a Westminster event yesterday, the UKIP leader announced that the party, which wants the UK to exit the EU, would "take the lead in the ground campaign", organising hundreds of public meetings across the country from September onwards. As with the Scottish independence referendum, the Electoral Commission will have to recognise one official pro-EU campaign, and one official anti-EU campaign. Farage said his party would work with other organisations campaigning for an EU exit, saying: "If any of those groups want to share our platform in the coming months they are very very welcome." A number of journalists at yesterday’s launch asked questions about whether Farage would lead the campaign. The UKIP leader acknowledged that he might not be the right person to lead the official campaign, but said it was important to get a campaign going and decide on a figurehead in time. "Look, you’re all obsessing about who is going to lead the no campaign – unless we get this thing kicked off there’s not going to be a no campaign," Farage said in response to one question, later answering another by saying: "I think whatever my shortcomings, and they may be many, I think I'm probably better than nobody." Liam O’Keefe, a senior director at FTI Consulting, said: "He said clearly that he might not be the right person to debate DC mano a mano. He recognises his weaknesses I think, that despite his statesmanlike qualities he may not be the best person." O’Keefe suggested that Boris Johnson might be an alternative. He said that Johnson’s term as London Mayor would probably have ended by the time the official campaign begins, by which point he might need a platform for his bid to succeed David Cameron as Prime Minister. "Johnson is still struggling for airtime and that might be the right time for him to mobilise the troops. If he feels he’s been outmanoeuvred by George Osborne, he might have nothing to lose." Sean Kemp, an associate director at public affairs firm Open Road, said he was certain Farage would not be the campaign’s main figurehead, saying he was "too divisive". Kemp said: "Obviously you wouldn’t deny him his voice, but if you look at polling around Europe, the more UKIP does well, the more pro-Europe sentiment does well - he makes anti-EU sentiment feel frankly a bit old-fashioned." However, he said that even in a more backseat role, Farage would still be likely to dominate the news agenda. Chris Rumfitt, founder and CEO of Corporate Reputation Consulting, said he thought Farage was "fundamentally one of the biggest problems for the anti camp", going on to say: "Some people love him but a larger number don’t. The campaign needs a respected and credible leader - I think the respected and credible angle is perhaps more important than the populism that Farage offers." Mark Gallagher, senior partner at Pagefield, said the official EU exit campaign needed to "find a way of working with UKIP and learning from it" but should also "guard against a dominant voice". He said: "If I was advising a ‘No’ campaign as a Pagefield client, I would propose pulling together a coalition of like-minded interests for the ground war - letting the many flowers in the meadow bloom – and deliver this through a comparatively loose, co-ordinating campaign group." "If the Brexit campaign is to gain any real traction between now and the referendum – let alone stand a chance of winning it - then it needs to find a way of working with UKIP and learning from it," he said. Gallagher also said that the emerging ‘No thanks - We’re going global’ campaign was doing a good job of keeping itself at arms length from politicians, who Gallagher said "should leave this work to the professional marketers and business people". Last week, PRWeek reported that a new pro-EU campaign group, whose founder members include Finsbury chairman Roland Rudd and 2012 Olympics marketing chief Greg Nugent, would bolster its PR function before its official launch this autumn.